Check FIVE national parks off your bucket list during this eight-day red rock adventure! Get ready to be transported to a land of geologic wonder! From the brilliant red spires of the Fisher Towers to the soaring heights of Angel’s Landing to the intimate waterfalls of The Narrows trail, the Mighty Five National Parks Tour will sweep you into an alien landscape that will have you questioning whether you’ve traveled to another (very beautiful) planet. Walk beneath delicate natural arches and through gardens of sandstone hoodoos. Dine on gourmet meals both in fine local restaurants as well as prepared trailside by your expert guides. Wade through a cool river at the bottom of a canyon while hanging gardens sway in the breeze overhead. The Mighty Five will leave you with vivid memories that will last a lifetime. Get your feet wet in The Narrows, a hike that’s more stream than trail, walking through a canyon punctuated by waterfalls and hanging gardens. Enjoy hitting five national parks in one week, and marveling at the diversity of landscapes that are only a few short miles apart. Explore Capitol Reef’s colorful landscape of tilted buttes, jumbled rocks and sedimentary canyons the Land of the Sleeping Rainbow. Look up at some of the clearest skies in the world. You’ve never seen the Milky Way like you will in the desert. Seek out the incredible diversity of life that calls Southern Utah home with the help of your knowledgeable guides. Ascend Walter’s Wiggles and Scout Lookout as you make your way up one of the most famous trails in the world to Angel’s Landing. The national parks: On this itinerary, you visit all five of Utah's national parks: Canyonlands, Arches, Capitol Reef, Bryce Canyon & Zion! The scenic drives: Don’t expect to sleep between destinations. The scenery along the highways is shockingly beautiful. Red rock canyons, mesas, and dwarf forests will keep your eyelids open in-transit. The hiking: With famous treks like Angel's Landing and the Narrows in Zion National Park featured on this itinerary, you're sure to experience a few unforgettable hikes. Begin your trip with early-morning pickups in Grand Junction by your guides, followed by a welcome meeting. Sit back and relax on a 2.5 hour shuttle to our first national park of the trip – Canyonlands! We’ll explore Utah’s largest national park with a few short hikes, eyeing the skyward-jutting spires and needles, deep craters, majestic buttes and blue-hued mesas that dot the landscape. Check into your accommodation and head to your first group dinner in Moab. Located in the heart of downtown Moab, this hotel is within walking distance of many local restaurants and souvenir shops. This hotel will serve as our base camp for exploration of Arches National Park and Canyonlands National Park. Your room was styled to capture and reflect the natural beauty of the surroundings. A warm palette featuring earthy browns and greens accented by luxurious natural granite is highlighted with photography by renowned local artist Tom Till. After a hearty breakfast, depart Moab for a hike to Fisher Towers. These towers are world renowned for their exciting rock-climbing routes and have been a favorite subject of photographers for years. After this beautiful hike, we settle in for a BBQ lunch at a nearby lodge. Mid-afternoon, enjoy some downtime during the heat of the afternoon by either relaxing poolside, exploring downtown Moab or grabbing a drink at a local brewery. Tonight, we meet back up for dinner at one of our favorite restaurants in town. We check out of our hotel early this morning to beat the crowds and the heat at Arches National Park. Hike into Delicate Arch for an awe-inspiring sunrise viewing, perfect for photographers. Then we head to Devil’s Garden where we’ll be sure to not only happen upon famous Landscape Arch, but also a few of our guides’ favorite arches in the area. After lunch, we shuttle through the heat of the afternoon to Capitol Reef National Park (3.5 hour transfer). Check in to Red River Ranch and enjoy dinner in the quaint town of Torrey nearby. Built on the grand scale of the great western lodges, The Lodge at Red River Ranch blends rich western history with modern convenience. You will find the accommodations comfortable, the food and service outstanding, the location breathtaking, and the overall experience, well… unforgettable. The lodge offers 15 unique guest rooms decorated with antique furnishings, western artwork and authentic artifacts. Every room includes its own fireplace and features a step-out balcony or patio and in-room music. This morning, we enjoy a short hike into our third national park, Capitol Reef. Native Americans once called this colorful landscape of tilted buttes, jumbled rocks and sedimentary canyons the Land of the Sleeping Rainbow. Early afternoon, we drive to Bryce Canyon National Park (3 hour transfer). 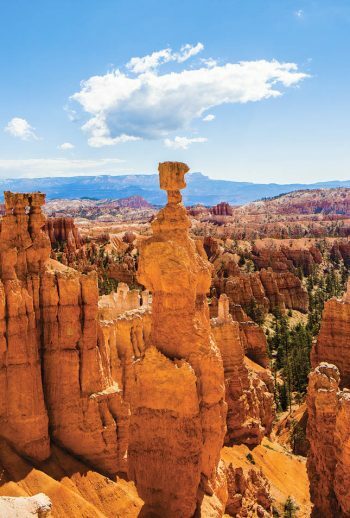 Upon arrival, embark on an introductory trek taking in Bryce Canyon’s sorbet-colored, sandcastle-like hoodoos and spires. Check into your Bryce Canyon lodging before a casual dinner with the group. Located in southwest Utah just north of Bryce Canyon National Park, the Bryce Canyon Grand Hotel is surrounded by fantastic scenery, most notably rock spires of every shape and size, known locally as “hoodoos.” Experience for yourself Bryce Canyon’s newest and most luxurious accommodations and amenities with the best in western hospitality. The Bryce Canyon Grand offers an enclosed courtyard offering guest privacy for the pool, whirlpool, and patio areas. You’re invited to experience Bryce Canyon City’s newest lodging facilities while visiting the breath taking Bryce Canyon National Park. After a hearty breakfast, embark on a hike through the magical hoodoo rock formations of Bryce’s Peek-A-Boo and Queens Garden trails. Trek through natural sculpted rock gardens of brilliantly colored spires, cliffs, and natural amphitheaters and take in the jaw dropping views from Rainbow Point. Share your favorite parts of Bryce Canyon with the group as you dine with everyone at Bryce Canyon Lodge. If you are a night owl, be sure to take advantage of one of the clearest night skies around and try your hand at finding some of the constellations. This morning, we look for the fifteen small arches along the aptly-named Arches Trail just outside of Bryce. Shuttle into Zion through an entrance that will leave you in awe as you wind through the magnificent canyon walls and towering cliffs that make up this majestic park (2-hour transfer). Hike to Angel’s Landing, one of the top-rated hikes in the world, before checking into your lodging for the next two nights, the Desert Pearl Inn. Take the evening to enjoy dinner on your own in Springdale. The award-winning SpringHill Suites Springdale Zion National Park offers a comfortable, elegant setting for travelers seeking inspiration, family adventure and relaxation. Located only one mile from Zion’s gate in the town of Springdale, this hotel is centrally located to explore all that Zion National Park has to offer. The outdoor pool and hot tub with amazing canyon views are the perfect way to relax after a day of exploring Zion! Explore more of the wonders that Zion has to offer today. Spend a full day walking and wading along the Virgin River, into the sheer walled canyon of the Narrows. Soak up the captivating scenery as you pass waterfalls, natural springs and hanging gardens. The Narrows hike is recognized as one of America’s best adventures by National Geographic and is one that you will not soon forget. Take time to relax and reflect at the Inn before our farewell dinner at Bit & Spur. Take one last hike through Zion National Park before we shuttle to St. George for drop-off at the airport or your post-trip hotel (1 hour transfer). Please plan on arriving at least one day prior to your trip departure. Day one of your itinerary starts in Grand Junction, CO at 7:00 or 7:20 am, depending on your hotel. Your trip ends with a drop-off at either the St. George airport (12:00 pm) or St. George hotel (12:30 pm). Hiking: 1 to 8 miles per hike, easy to strenuous terrain (sometimes multiple shorter hikes will be completed within one day). Discovery: Learn about how the Canyonlands contain over 200 million years of geological history, and continues to serve as an outdoor laboratory for scientists from all over the world. From the Island in the Sky’s Upheaval Dome to the Grabens area of the Needles, Canyonlands possesses many uncommon landforms. Stare up in awe at the 900 foot Titan at Fisher Towers: the first climb took place in 1962 and was sponsored by the National Geographic Society! Discover why Moab, with itsunique combination of beautiful red rock scenery, two national parks, and the cool waters of the Colorado River, is one of the most sought out vacation destinations in the west. Check out Capitol Reef National Park’s centerpiece – the Waterpocket Fold, a 100-mile monocline (buckle in the earth’s crust) that blocked explorers’ westward migration as a reef blocks a ship’s passage. Learn about Canyon Country geology, including hoodoos, arches, alcoves and fins. Known for its slot canyons, soaring towers and monoliths, and scenic sandstone, Zion National Park is full of unique formations begging to be explored. Delve into the 150 million year old history of Zion canyon’s geologic formations. Bryce Canyon National Park, named after Ebenezer Bryce, a Mormon homesteader in the 1870’s, will satisfy your adventurous spirit with its options for awe- inspiring hikes. Discover your inner thrill seeker as you ascend the narrow switchbacks to Angel’s Landing. Absorb the magnificence of one of the most legendary canyons in all of Zion National Park, the Zion Narrows, as you walk and wade along the North Fork of the Virgin River in the midst of towering canyon walls. Come explore Red Rock Country and five national parks with Austin Adventures to witness for yourself what all the hype is about!